A Milestone for Chrome Security: Marking HTTP As “Not Secure” — Chrome 68, released this week (more on that below), shows a “Not secure” message in the location bar when accessing a site over unencrypted HTTP. The march to ‘HTTPS everywhere’ continues. Adding Particle Effects to DOM Elements with Canvas — A neat tutorial showing how to create a basic HTML-to-particle effect. You have to balance a few concepts to make it work but the result is striking. 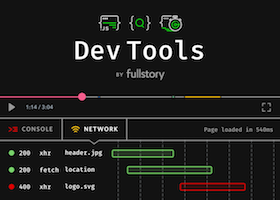 Developer Tools for Every Customer Session – New in FullStory — Your browser developer tools are now available for site sessions other than your own. Easily understand performance issues thanks to page speed metrics, network analysis, downloadable HAR files, and comprehensive stack traces on all your visitors’ sessions. Chrome 68 Released: What's New For Developers? — Other than the ‘Not Secure’ marker (above), Chrome 68 provides the Page Lifecycle API for you to detect when your tab has been suspended or restored, the Payment Handler API, and lots of neat DevTools improvements. Blink Signals Intent to Implement 'Portals' — Portals (explained here) are a proposed approach for enabling seamless navigation between sites or pages (such as showing one page within another via a ‘portal’ before navigating to it). Find A FrontEnd Job Through Vettery — Vettery specializes in developer roles and is completely free for job seekers. An In-Depth Look at the Page Lifecycle API — A Chrome-only API for now that brings app lifecycle features common on mobile operating systems to the web. It ships with Chrome 68. Converting Images to WebP — The many ways in which you can convert existing images to the WebP format. An excerpt from the recently released ‘The WebP Manual’ ebook. 4 CSS Tricks I’ve Learnt The Hard Way — Quick box sizing, centering, and positioning tips. How to Make a Modern Dashboard with NVD3.js — NVD3.js is a set of chart components built around D3.js. TOAST UI Grid 3.0: A Data Grid Control for the Web — This data grid component works down to IE8, works with many data types, and is easily rethemed. 4 Things You Can Do with CSS Pointer Events — Change the styling of a parent on hover, make only pseudo elements clickable, and more. Unswitch: An Event Handler for Nintendo Switch Controllers on the Web — Based on the Gamepad API.